Effective communication skills are essential to quality healthcare, and especially crucial for providers caring for patients with chronic disease. This course delivers strategies for improving communication with patients and families, while reducing barriers to effective communication about diagnosis, prognosis and serious illness. 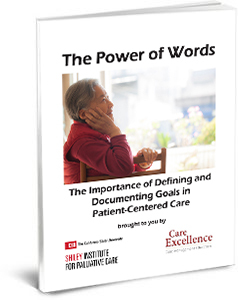 This curriculum also includes in-depth instruction in advance care planning, advance directives, and other tools that help ensure patients have the defining voice in their own healthcare decisions. You will learn how to build advance care planning into your primary care practice, how to incorporate evidence-based techniques for conducting difficult conversations, and how to utilize legally binding forms to aid in documentation. This is the second course in a nine-part series, Primary Palliative Care Skills for Physicians, NPs and PAs. Take each course individually or enroll in the full series for a significant discount! Learn more about the full series here! The Doctors Company designates this activity for a maximum of 5.75 AMA PRA Category 2 Credit(s)™. Physicians should claim only the credit commensurate with the extent of their participation in the activity.